1 of 2 Whisk together buttermilk and mayonnaise until smooth. Stir in Roquefort, onion powder, 1/4 tsp of the salt and the pepper. Cover and refrigerate until using. 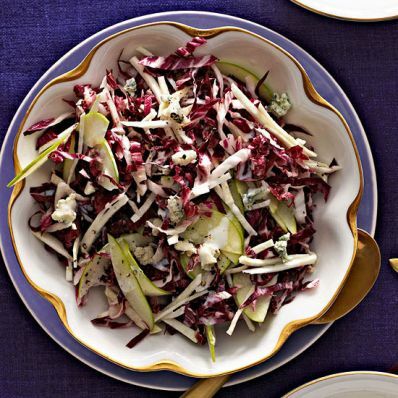 2 of 2 Toss together radicchio, celery root, apples, lemon juice and remaining 1/4 tsp of the salt. Drizzle half the dressing on top of salad and serve remaining dressing on the side. Per Serving: 3 g sat. fat, 2 g fiber, 14 g carb., 5 g pro., 15 mg chol., 8 g Fat, total, 476 mg sodium, 136 kcal cal.